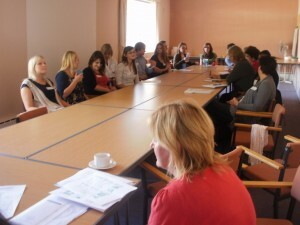 In July 2010 Jess Heron ran a qualitative research workshop for members of APP who had expressed an interest in learning more about conducting research. The workshop took place over 2 days at the Centre for Excellence in Interdisciplinary Mental Health (CEIMH) in Birmingham. Women learned about ‘service-user’ involvement from Dr Jess Heron and Professor Ann Davis. We discussed opportunities for those who have experienced PP to get involved in research- from helping to develop research studies and commenting on research proposals to sitting on ethics committees, funding review boards, advisory groups or NHS service development teams. Dr Jon Ives from the Centre for Biomedical Ethics and Sonal Shah from the Dept of Primary Care ran sessions on the theory behind qualitative research, one to one interviewing skills and group facilitation. On day 2 we designed a mini study to investigate how women recover from PP. Women used the skills they had practised to interview each other about their experiences of recovery. The interviews have been analysed and written up for an academic journal. The information generated has been used to develop web advice about recovery. We are extremely grateful to CEIMH, the Birmingham and Solihull Mental Health Trust and The Mental Health Research Network Health of England Hub for funding the workshop and resulting projects.